Tuote 110477. 2N2905 60V 0.6A 0.8W PNP TO-39. Tuote 110476. 2N2907A 60V 0.6A PNP TO-18. Tuote 110478. 2N3906 40V 0.2A 0.6W PNP TO-92. Tuote 110479. 2N4033 80V 1A 0.8W PNP TO-39. Tuote 110480. 2N4920 80V 1A 30W PNP TO-126. Tuote 110481. 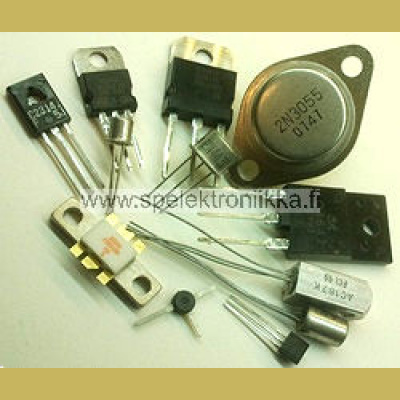 2N5323 75V 2A 10W PNP TO-39. Tuote 110482. 2N5401 160V 0.6A 0.6W PNP TO-92. Tuote 110483. 2N5416 350V 1A 10W PNP TO-39. Tuote 110485. 2SA937 50V 0.1A 0.3W PNP SOT33. Tuote 110487. 2SA1015 50V 0.15A 0.4W PNP TO-92. Tuote 110488. 2SA1145 150V 0.05A 0.8W PNP TO-92 ( 9MM ). Tuote 110489. 2SA1206 15V 0.05A 0.6W PNP TO-92. Tuote 110490. 2SA1232 130V 10A 100W PNP TO-3PF. Tuote 110491. 2SA1262 60V 4A 30W low saturation PNP TO220. Tuote 110544. 2SA1300 20V 2A 0.75W PNP low saturation TO-92. Tuote 110546. 2SA1303 150V 14A 125W PNP TO-3P. Tuote 110547. 2SA1358 120V 1A 10W PNP TO-126. Tuote 110548. 2SA1491 140V 10A 100W PNP TO218.